Following the fire, HeartShare staff helped five ladies with intellectual and developmental disabilities adjust to the reality of losing their home and personal belongings. 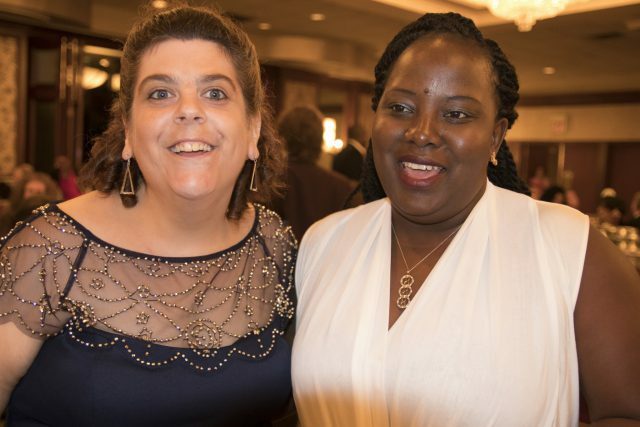 While at Hampton Inn, staff still brought the ladies shopping for new dresses to enjoy a night out at HeartShare Residential Services Dinner Dance on September 19, 2016, which was a welcome distraction considering recent circumstances. HeartShare’s Moore Residence has been selected for the agency’s Spirit Award. The award reads “The Spirit Award is presented proudly to the staff of the Moore Residence in recognition of Outstanding Services to the Program’s Individuals.” The award will be presented to the program’s employees on Thursday, October 27th. Moore Residence in Staten Island has experienced extraordinary stress following a fire in August. The five women with disabilities who lived in the Eltingville home have been re-located to Hampton Inn and will soon move into temporary housing. The ladies have resumed their daily routine, such as attending their respective Day Habilitation Programs. “With the support of the great staff at Moore Residence, the ladies have adjusted quite well. The staff’s spirit and tenacity truly represent ‘grace under fire,'” said Joyce Levin, Senior Vice President for Developmental Disabilities Services. The Spirit Award is given twice annually to a HeartShare Developmental Disabilities Services program in the areas of overall programmatic excellence and dedication to our individuals with intellectual and developmental disabilities. The award is a part of HeartShare’s culture of acknowledging outstanding employees and encouraging their professional growth.